Liszt completed the ‘Twelve Great Studies’ in October 1837, and they were published the following year. Schumann gave them the most enthusiastic notice, but lamented that only their composer would ever be able to play them, such was their technical requirement. Nonetheless, his wife Clara immediately learned the ninth of them, and by degrees they enjoyed at the very least an infamy, if not quite a popularity, amongst performers, and became the stuff of legend to audiences. Of course, the versions which are regularly performed today, the Douze Études d’exécution transcendante of 1851 (recorded in Volume 4 of this series), were essentially simplifications of the present set, with a number of cuts, recastings and musical second thoughts and decked with titles. But the almost absurd level of difficulty of the 1837 set lends it a particular devil-may-care quality which one can observe in the early operatic fantasies, the Album d’un voyageur and the Magyar Rapszódiák. This quality is one which has brought much unwarranted criticism upon Liszt’s head: the musical value of the works remains incontestable, and it is on the poor performer’s head that all complaint should fall if the undeniable struggle to overcome the most taxing demands should obscure the fundamental clarity and simple beauty of the musical discourse. That these works’ inner nature is simple and straightforward suggests itself from their history: Liszt took music composed in his childhood (precocious source material, to be sure) as the basis for studies in musical expression seen through the virtue of complete technical accomplishment. In short, musical virtuosity—the first principle of all great études. For those who know and love the 1851 Studies a word of warning: despite the many similarities of text, the 1837 pieces often have rather a different character from the later set, especially because of different tempo indications and some very specific instructions for tempo rubato for which Liszt devised his own armory of symbols (for short pauses and for slight retardations and accelerations of particular groups of notes). Liszt had composed his Étude en douze exercices at the age of fourteen (see Volume 26 of this series)—all that he wrote of the 48 pieces originally announced. When he came to the 1837 set he originally announced 24 pieces, no doubt intending to go cyclically through all the keys, but, as before, he drew the line at 12, and thus offers works on the ‘flat’ side only of the circle of fifths. (As is well known, Lyapunov composed a complementary set of Douze Études d’exécution transcendante in homage to Liszt, through all the ‘sharp’ keys.) It is instructive to compare all the versions of these works, so we may observe straightaway that the 1837 pieces match number for number with the 1851 versions, but that there is a small change of plan between the 1826 and the 1837 sets: No 7 of the juvenile set is transposed and reworked into No 11, and the original number 11 is discarded. The replacement No 7 is a new composition, but it uses material from the introduction to the early Impromptu sur des thèmes de Rossini et Spontini (also in Volume 26). The 1837 Studies are, like the later versions, inscribed to Carl Czerny, Liszt’s sometime teacher, and the opening piece is a dedicatory flourish to that kindly pedagogue. It is probably this piece to which Liszt refers as a ‘Preludio-Studio’ in a letter of 1838, and the final version, only very slightly revised, bears the title Preludio. The Second Study, marked ‘Molto vivace a capriccio’, presents a technique of repeated notes where the first is struck by the index finger and the second by the thumb, accompanied by its octave with the fifth finger—a technique only employed by Liszt in a few early works, and much better suited to the pianos of the 1830s than to the modern machine, with its ungratefully heavy repetition mechanism. It must have been a problem even for the instruments and performers of the 1850s, too, because all trace of this technique is expunged from the final version. When Liszt titled the 1851 version of the Third Study Paysage (‘Landscape’) he altered its atmosphere to accord with this new suggestion. It remains interesting that the speedy juvenile effort in 4/4 is already transformed into a ‘Poco adagio’ in 6/8, but in the 1837 piece the climax yields an impassioned page of ‘Presto agitato assai’ which Liszt later deemed superfluous. The Fourth Study originated without its melody in the simple crossed-hand exercise of 1826, and is en route to becoming the familiar Mazeppa. (A further version of this piece, titled Mazeppa, with a new introduction and coda and a dedication to Victor Hugo, was made in 1840. It was intended to include this work in the present volume, and the piece was recorded, but the restriction on the maximum playing-time of a compact disc proved the undoing of the plan, and the ‘extra’ Mazeppa will appear in a future volume.) Curiously, the 1837 version of the piece begins in a rather less complicated way than its 1851 counterpart, and plunges straight in to the principal material, with triplet chord accompaniment. Whereas in the final version the middle section takes the tempo down a fraction, here Liszt asks for a slight increase, and the whole texture is quite different. The coda, not yet having reference to Hugo’s poem, is brisk and concise. How Liszt transformed his pretty little 1826 piece into the Fifth Study is a minor miracle. Of course the 1851 version, Feux-follets (‘Will-o’-the-wisps’), with its intricate double notes, needs no introduction. (Incidentally, this piece is often taken at far too fast a tempo in the hope that the listener will not hear that the difficulties have been diluted by a simplification of the inner voice in the right hand—even in some of the most celebrated performances. Liszt marked it ‘Egualmente’ in 1837, ‘Allegretto’ in 1851.) In the 1837 version the coda is marginally shorter, but otherwise the structure of the piece is familiar. The double notes and repeated chords are a good deal trickier than in the 1851 text. In the Sixth Study Liszt has again transformed the whole notion of his 1826 prototype by changing the metre from duple to triple time. Although he dropped the idea in 1851, Liszt asks for the opening statement to be played by the left hand alone. Otherwise the piece resembles the later Vision quite closely, excepting a brief gesture at the reprise in double octaves and some daring harmony at the coda which even Liszt felt obliged to tone down in the later version. In the thematic catalogue of his works which appeared during his lifetime, Liszt marks with an asterisk all those pieces which he requires to be played only in their final versions. The 1851 Studies are a case in point. We beg leave to differ from the master in this and in most other instances; a great man’s judgement of his own past work need not be uncritically revered, and besides, Liszt, in his almost careless abandonment of all his earlier productions, discards many pieces which never came to be revised. In the Seventh Study of the 1837 set we have a piece which is widely regarded to be superior to its 1851 revision: Eroica—it certainly holds together better, and the transition material from the introduction to the main theme (and its repetition towards the end) is altogether more convincing than the dotted rhythms which Liszt substituted in 1851. There is also a final variation of the theme which was later cut, where again Liszt takes a very avant garde harmonic position. Liszt asks the impossible in the first bar of the Eighth Study: 42 notes in rapid fire are asked to be held in one pedal, and yet six melody notes in each hand are asked to be accentuated. This can very nearly be done on a piano of the 1830s, but Liszt wisely removed all the demi-semiquavers in the 1851 version. Nevertheless, the sheer pandemonium here and elsewhere where this theme occurs is undeniably effective. In 1851 Liszt removed a most striking idea: the third theme, which follows hard upon the second, dactylic hunting motif, keeps the metre and rhythm intact in the left hand, whilst the right hand picks out a new theme with one note to its every four, but in a metre which does not square arithmetically with the left hand—dizzying both to play and to hear. (Later, Liszt made the melody conform to the left hand.) The later title Wilde Jagd (‘Wild Hunt’) would have suited even better here. Apart from the catches in the breath created by the addition in 1851 of rests at the beginning of each melodic group, the Ninth Study and the later Ricordanza are very similar. Here there are rather thicker chordal textures, and one or two disquieting dissonances towards the coda, but the same air of nostalgia is ineluctable. The 1826 forerunner of this piece remains the most astonishing piece of the juvenile set—the themes and harmonies were taken over almost unchanged in 1837, and the filigree decoration sets off their beauty in the subtlest way. The Tenth Study, usually accounted to be the finest of the 1851 set, is even more imposing in the 1837 version, although Liszt’s later solution for the layout of the opening material produces a more restless effect by eliminating the demand for playing melody notes with the left hand in amongst double sixths in the right. In a very solid sonata structure, the 1837 text does not break the flow towards the end of the development, but does ask for some very awkward playing of enormous stretches. (Liszt’s hand almost certainly contracted as he grew older. Amy Fay reliably reports that the old Liszt could just take the black-note tenth chords at the end of the slow movement in Beethoven’s ‘Hammerklavier’ Sonata. In all his revisions Liszt removes or arpeggiates any interval greater than a ninth, whereas tenths and elevenths abound in the works from his years as a public performer.) The 1837 version has a much longer coda, which abruptly changes metre and becomes ferocious, in accordance with Liszt’s own performance directions. When Liszt transformed the Twelfth Study into Chasse-neige (‘Snow flurry’) he introduced some chromatic thirds to reinforce the idea of the whirlwinds, and they may seem unexpectedly absent here. But in compensation there is a beautiful introduction which was later discarded, and which reappears at the recapitulation, where later we find a great many scales. In general, there is rather more of the tremolo in the 1837 version, and one or two typically pungent harmonic effects made more conventional in 1851. The final cadence, as in the later version, cannot be used to make a thunderous ending, and Liszt leaves us poised on a second-inversion triad, as if there might be more to come. But the only extant page of sketches for an F sharp major study which should have begun the second part of the enterprise clearly belongs to an abandoned continuation of the 1826 series. At the end, therefore, Liszt’s great compendium of virtuosity peacefully turns its back upon its vaunted object. By way of a brief encore, and in the farthest tonality from the preceding piece (E minor/major), this programme concludes with the 1840 version of a study later reworked in 1852 with the title Ab Irato (‘In a rage’). The less assuming but more cumbersome title of the present version—composed, along with studies by such as Mendelssohn and Chopin for the famous piano manual of Moscheles and Fetis—reads in full: Morceau de salon—Étude deperfectionnement de la Méthode des Méthodes. This athletic little piece has a brief lyrical moment towards the coda (in the 1852 version the pace is slowed at this point) which bears only the most accidental and distant relationship to a theme from the symphonic poem Les Préludes—it seems a pity that some commentators have sought to establish a closer link—but which derives, in fact, from the group of three notes, now rising, now falling, which inform the whole work. Liszt acheva les «Douze Grandes Études»en octobre 1837, et celles-ci furent publiées l’année suivante. Schumann les accueillit avec grand enthousiasme, mais déplora que, leur exigence technique étant telle, seul leur compositeur serait jamais capable de les jouer. Néanmoins, sa femme Clara apprit immédiatement la neuvième, et, petit à petit, les études bénéficièrent au moins d’une certaine notoriété, si ce n’était d’une certaine popularité, parmi les interprètes, et devinrent matière à légende pour le public. Bien entendu, les versions généralement interprétées aujourd’hui, les Douze Études d’exécution transcendante de 1851 (enregistrées dans le Volume 4 de cette série), représentaient essentiellement des simplifications de la présente série, par un certain nombre de coupures, de remaniements et de réflexions musicales, et par les titres qui leur furent attribués. Mais, le niveau de difficulté presque absurde de la série de 1837 lui confère une qualité particulièrement casse-cou, que l’on peut observer dans les premières fantaisies lyriques, Album d’un voyageur et Magyar Rapszódiák. C’est cette qualité qui a entraîné des critiques totalement injustifiées à l’égard de Liszt: la valeur musicale des œuvres demeure incontestable, et c’est sur la tête de l’interprète que toute plainte devrait retomber si la difficulté indéniable pour vaincre les exigences les plus ardues en vient à obscurcir la clarté fondamentale et la simple beauté du discours musical. La nature intérieure simple et directe de ces œuvres est suggérée par leur histoire: Liszt utilisa de la musique qu’il avait composée au cours de son enfance (matériau de source précoce, sans aucun doute) comme base pour des études d’expression musicale, vue à travers la vertu de l’accomplissement technique total. En bref, la virtuosité musicale—le principe primordial de toutes les grandes études. Pour ceux qui connaissent et apprécient les Études de 1851, un avertissement: malgré les nombreuses similarités au niveau du texte, les morceaux de 1837 possèdent souvent un caractère plutôt différent de la série publiée plus tard, surtout à cause des indications de tempo différentes et de certaines instructions très spécifiques de tempo rubato, pour lequel Liszt conçut sa propre armée de symboles (pour les pauses courtes et les légers ralentissements, ainsi que les accélérations de groupes particuliers de notes). 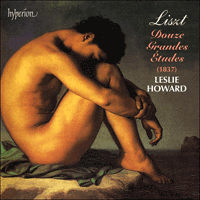 Liszt avait composé son Étude en douze exercices à l’âge de quatorze ans (voir le Volume 26 de cette série)—c’était là tout ce qu’il avait écrit des 48 morceaux annoncés à l’origine. Lorsqu’il en vint à la série de 1837, il annonça d’abord 24 morceaux, ayant sans aucun doute l’intention de passer par tous les tons de manière cyclique, mais, comme auparavant, il s’arrêta à 12, et nous offre ainsi des œuvres uniquement dans la partie «bémol» du cycle des quintes. (Comme on le sait, Lyapunov composa une série complémentaire de Douze Études d’exécution transcendante en hommage à Liszt, en passant par tous les tons «dièses».) Il est instructif de comparer toutes les versions de ces œuvres, grâce auxquelles nous pouvons ainsi observer immédiatement que les morceaux de 1837 correspondent dans leur nombre aux versions de 1851, mais qu’il existe un petit changement de plan entre les séries de 1826 et 1837: no 7 de la série plus récente est transposé et retravaillé dans no 11, et le morceau numéro 11 original est abandonné. Le no 7 de remplacement constitue une nouvelle composition, mais il utilise un matériau tiré de l’introduction d’un premier Impromptu sur des thèmes de Rossini et Spontini (également dans le Volume 26). Les Études de 1837 sont, comme les versions plus tardives, dédiées à Cari Czerny, professeur de Liszt pendant une certaine époque, et le morceau d’ouverture constitue une fioriture dédicatoire à l’aimable pédagogue. C’est probablement de cette pièce qu’il s’agit lorsque Liszt se réfère à un «Preludio-Studio» dans une lettre de 1838, et la version finale, qui n’est que très légèrement révisée, est intitulée «Preludio». La Seconde Étude, portant la mention «Molto vivace a capriccio», présente une technique de notes répétées, où la première est frappée par l’index et la seconde par le pouce, accompagnée par son octave avec le cinquième doigt—technique uniquement employée par Liszt dans certaines de ses premières œuvres, et beaucoup mieux appropriée aux pianos des années 1830 qu’à l’instrument moderne, avec son lourd mécanisme ingrat de répétition. Ce fut sûrement un problème aussi pour les instruments ainsi que pour les interprètes des années 1850, car toute trace de cette technique est rayée de la version finale. Lorsque Liszt intitula la version de 1851 de la Troisième Étude Paysage, il en modifia l’atmosphère pour être en accord avec cette nouvelle suggestion. Le fait que le premier essai juvénile en 4/4 soit déjà transformé en un Poco adagio en 6/8 demeure intéressant, mais, dans le morceau de 1837, l’apogée offre une page pleine d’exaltation Presto agitato assai, que Liszt jugea plus tard superflue. La Quatrième Étude parut sans sa mélodie dans le simple exercice de croisement de mains de 1826, pour finalement devenir le Mazeppa que nous connaissons. (Une autre version de ce morceau, intitulée «Mazeppa», comportant une nouvelle introduction et une coda, dédiée à Victor Hugo, fut produite en 1840. Nous avions l’intention d’inclure cette œuvre dans le présent volume, et le morceau fut enregistré, mais la restriction de durée de lecture maximum d’un disque compact a rendu le projet irréalisable, aussi le Mazeppa «supplémentaire» paraîtra-t-il dans un autre volume.) Curieusement, la version de 1837 de la pièce commence de façon plutôt moins compliquée que son analogue de 1851, et plonge directement dans le matériau principal, avec un accompagnement d’accords en triolets. Tandis que dans la version finale, la section du milieu réduit le tempo d’une fraction, ici Liszt requiert une légère augmentation, et la texture de l’ensemble paraît assez différente. La coda, n’ayant pas encore de référence au poème de Hugo, est animée et concise. La façon dont Liszt transforma son agréable petite pièce de 1826 en Cinquième Étude constitue un petit miracle. Bien entendu, la version de 1851: Feux-follets, avec ses notes doubles enchevêtrées, ne nécessite pas d’introduction. (Soit dit en passant, ce morceau est souvent pris à un tempo beaucoup trop rapide, dans l’espoir de ne pas révéler à l’auditeur que les difficultés ont été atténuées par la simplification de la partie intérieure à la main droite—cela arrive même dans certaines des interprétations les plus renommées. Liszt y inscrivit l’indication «Egualmente» en 1837, «Allegretto» en 1851.) Dans la version de 1837, la coda est légèrement plus courte, mais à part cela, la structure du morceau reste familière. Les notes doubles et les accords répétés sont nettement plus compliqués que dans le texte de 1851. Dans la Sixième Étude, Liszt a encore une fois transformé la notion entière de son prototype de 1826, en changeant le mètre d’une mesure à deux temps en une mesure à trois temps. Bien qu’il ait abandonné l’idée en 1851, Liszt requiert de l’exposition d’ouverture qu’elle soit jouée par la main gauche seule. A part cela, le morceau ressemble d’assez près à Vision, parue plus tard, à l’exception d’un geste bref à la reprise en doubles octaves et d’une harmonie assez audacieuse à la coda, que même Liszt se sentit obligé d’adoucir dans la version ultérieure. Dans le catalogue thématique de ses œuvres, qui parut de son vivant, Liszt marque d’une astérisque toutes les morceaux qu’il souhaite vivement voir jouer dans leurs versions finales. Les Études de 1851 en constituent un exemple typique. Nous demandons ici, ainsi que dans la plupart des autres cas, la permission de ne pas être de l’avis du maître; le jugement que porte un grand homme sur son travail personnel passé ne doit pas nécessairement être accepté aveuglément, et, en outre, Liszt, dans son abandon presque insouciant de toutes ses premières productions, rejette de nombreuses morceaux qui ne vinrent jamais à être révisées. Dans la Septième Étude de la série de 1837 se trouve un morceau considéré comme étant largement supérieur à sa révision de 1851: Eroica—morceau qui se tient certainement mieux, et dont le matériau de transition entre l’introduction et le thème principal (et sa répétition vers la fin) est somme toute plus convaincant que les notes pointées que Liszt lui substitua en 1851. On trouve également une variation finale du thème qui fut plus tard éliminé, dans lequel Liszt prend une position harmonique très avant-gardiste. Liszt demande l’impossible dans la première mesure de la Huitième Étude: il réclame 42 notes, le tout en un feu rapide et tenu en une pédale, ainsi que l’accentuation de six notes de mélodie à chaque main. Cela peut presque se faire sur un piano des années 1830, mais Liszt retira prudemment toutes les triples croches dans la version de 1851. Néanmoins, le véritable tohu-bohu créé ici et ailleurs, là où ce thème se présente, produit certainement son effet. En 1851, Liszt retira une idée des plus frappantes: le troisième thème, qui suit de près le deuxième motif rapide dactylique, garde le mètre et le rythme intacts pour la main gauche, tandis que la main droite joue d’une manière hésitante un thème nouveau en reprenant une note de la main gauche contre quatre, mais dans un mètre qui ne coïncide pas de façon arithmétique avec la main gauche—étourdissant aussi bien à jouer qu’à entendre. (Plus tard, Liszt fit en sorte d’adapter la mélodie pour la main gauche.) Le titre Wilde Jagd («Chasse sauvage») donné ultérieurement aurait été encore plus approprié ici. A part les reprises de souffle successives, créées par l’ajout en 1851 de pauses au début de chaque groupe mélodique, la Neuvième Étude et le Ricordanza composé plus tard paraissent très similaires. On y trouve des textures d’accord plutôt plus denses, ainsi qu’une ou deux dissonances inquiétantes vers la coda, mais le même air de nostalgie reste inéluctable. Le précurseur de 1826 de cette œuvre demeure la plus étonnante pièce de la série antérieure—les thèmes et les harmonies furent repris presque sans changement en 1837, et l’ornementation en filigrane met en valeur leur beauté de la manière la plus subtile. La Dixième Étude, généralement considérée comme la plus raffinée de la série de 1851, est encore plus imposante dans la version de 1837, bien que la solution ultérieure de Liszt par rapport à la disposition du matériau d’ouverture produise un effet plus agité, par l’élimination de l’indication déjouer les notes de la mélodie de la main gauche au milieu des doubles sixtes de la main droite. Dans une structure de sonate très solide, le texte de 1837 ne rompt pas le flot vers la fin du développement, mais réclame une interprétation très difficile avec de très grands étirements. (La main de Liszt se contracta presque certainement avec l’âge. Amy Fay raconte de source sûre que Liszt, dans sa vieillesse, pouvait à peine jouer les accords de dixièmes sur les noires à la fin du mouvement lent de la Sonate «Hammerklavier» de Beethoven. Dans toutes ses révisions, Liszt retire ou arpège tout intervalle plus grand qu’une neuvième, alors que les dixièmes et les onzièmes abondent dans les œuvres composées au cours de ses années en tant que pianiste de concert.) La version de 1837 possède une coda beaucoup plus longue, qui change abruptement de mètre et devient féroce, selon les indications de Liszt. Lorsque Liszt transforma la Douzième Étude en Chasse-neige, il introduisit des tierces chromatiques afin de renforcer l’idée de tourbillons de vent, et ceux-ci peuvent paraître étonnamment absents ici. Mais, pour compenser, on trouve une belle introduction qui fut plus tard abandonnée, et qui réapparaît à la récapitulation, dans laquelle nous découvrons ultérieurement bon nombre de gammes. En général, il y a davantage de trémolos dans la version de 1837, de même qu’un ou deux effets harmoniques typiquement poignants, rendus plus conventionnels en 1851. La cadence finale, tout comme dans la version qui suivit, ne peut être utilisée pour créer une fin retentissante, et Liszt nous laisse en suspens sur un accord parfait en deuxième renversement, comme si l’on attendait encore autre chose. Mais la seule page encore existante d’ébauches pour une étude en Fa dièse majeur, qui aurait dû introduire la seconde partie de la série, appartient clairement à une prolongation abandonnée de celle de 1826. Ainsi, à la fin, le grand condensé de virtuosité de Liszt tourne paisiblement le dos à son objectif tant vanté. En guise de bis bref, et dans la tonalité la plus éloignée de la pièce précédente: Mi mineur/majeur, ce programme se conclut par la version de 1840 d’une étude plus tard retravaillée en 1852 sous le titre Ab Irato («Pris de rage»). Le titre moins présomptueux mais lourd de la présente version—composée en même temps que des études de compositeurs tels que Mendelssohn et Chopin, pour le célèbre manuel de piano de Moscheles et Fétis—se lit en entier comme suit: Morceau de salon—Étude de perfectionnement de la Méthode des Méthodes. Cette petite pièce athlétique possède un moment lyrique bref vers la coda (dans la version de 1852, l’allure est ralentie en cet endroit), qui ne maintient qu’un rapport des plus accidentels et distants avec un thème tiré du poème symphonique Les Préludes—il semble dommage que certains commentateurs aient cherché à établir un lien plus proche—mais qui provient en fait du groupe de trois notes, tantôt ascendantes, tantôt descendantes, qui imprègnent toute l’œuvre. Liszt vollendete die „Zwölf Großen Etüden“ im Oktober 1837 und im darauffolgenden Jahr wurden sie veröffentlicht. Schumann begrüßte die Etüdenreihe mit einer Anforderungen enthusiastischen Rezension, beklagte allerdings, daß aufgrund der technischen Anforderungen nur der Komponist jemals in der Lage sein werde, sie zu spielen. Dennoch lernte seine Ehefrau Clara sehr schnell die neunte von ihnen, und allmählich erfreuten sie sich zumindest einer Verrufenheit, wenn auch nicht gerade einer Beliebtheit, unter den Ausfahrenden und wurden für die Zuschauer zu Legenden bildendem Stoff. Natürlich sind die heutzutage regelmäßig aufgeführten Fassungen, die Douze Etudes d’exécution transcendante von 1851 (aufgenommen für Bd. 4 dieser Serie), im wesentlichen Vereinfachungen der vorliegenden Etüdenreihe, mit einigen Streichungen, Umbesetzungen und musikalischen Sinneswandlungen, und reich geschmückt mit Titeln. Der fast schon absurde Schwierigkeitsgrad der Reihe von 1837 verleiht ihr jedoch eine ganz eigene Nach-mir-die-Sintflut-artige Eigenschaft, die man auch in den frühen opemhaften Fantasien, dem Album d’un voyageur und der Magyar Rapszódiák, beobachten kann. Diese Eigenschaft hat Liszt viel ungerechtfertigte Kritik eingebracht: Der musikalische Wert der Werke bleibt unanfechtbar, und jede mögliche Beschwerde sollte dem armen Vortragenden angelastet werden, falls die nicht zu verleugnende Anstrengung, die ungeheuren Schwierigkeiten zu überwinden, die grundlegende Klarheit und einfache Schönheit des musikalischen Diskurses überschatten sollte. Daß die innere Natur dieser Werke einfach und geradlinig ist, deutet schon ihre Geschichte an: Liszt wählte Musik, die er in seiner Kindheit komponiert hatte (frühreifes Quellenmaterial, in der Tat), als Basis für Studien des musikalischen Ausdrucks unter Einbeziehung des Vorteils vollkommener technischer Fertigkeit. Kurz gesagt, musikalische Virtuosität—das oberste Prinzip aller großen Etüden. Diejenigen, die die Etüden von 1851 kennen und lieben, mögen sich warnen lassen: Trotz der großen Ähnlichkeit der Texte haben die Stücke von 1837 oft einen ziemlich anderen Charakter als die spätere Etüdenreihe, insbesondere aufgrund von unterschiedlichen Tempo-Angaben und einigen sehr spezifischen Anweisungen für willkürliches Zeitmaß, für das Liszt ein persönliches Arsenal von Symbolen entwarf (für kurze Pausen und für leichte Verzögerungen und Beschleunigungen bestimmter Notengruppen). Liszt hatte seine Étude en douze exercices im Alter von vierzehn Jahren komponiert (siehe Bd. 26 dieser Serie)—das heißt, 12 von 48 Stücken, die er ursprünglich angekündigt hatte. Als er die Etüdenreihe von 1837 begann, kündigte er ursprünglich 24 Stücke an, zweifellos in der Absicht, zyklisch alle Tonarten durchzugehen, aber wie zuvor hörte er bei der zwölften auf und bietet daher aus dem Quintenzirkel nur Werke der erniedrigten Seite an. (Lyapunov hat bekanntlich eine komplementäre Reihe von Douze Études d’exécution transcendante zu Ehren von Liszt komponiert, die alle erhöhten Tonarten abdeckt.) Es ist aufschlußreich, alle Fassungen dieser Werke zu vergleichen, so daß man sofort erkennen kann, daß die Stücke von 1837 Nummer für Nummer mit den Fassungen von 1851 übereinstimmen, daß es allerdings eine kleine planmäßige Änderung gibt zwischen den Reihen von 1826 und 1837: Die Nr. 7 der Etüdenreihe seiner Jugend wurde umgestellt und überarbeitet zu Nr. 11, während die ursprüngliche Nr. 11 gestrichen wurde. Die Ersatz-Nr. 7 ist eine neue Komposition, verwendet jedoch Material aus der Einleitung zu dem frühen Impromptu sur des thèmes de Rossini et Spontini (ebenfalls in Bd. 26). Die Etüden von 1837, wie auch die späteren Fassungen, sind Liszts ehemaligem Lehrer Carl Czerny gewidmet, und das Anfangsstück ist ein wahrer Fanfarenstoß einer Widmung für diesen freundlichen Pädagogen. Es ist wahrscheinlich dieses Stück, auf das Liszt sich in einem Brief von 1838 mit „Preludio-Studio“ bezieht, und die endgültige, nur sehr leicht veränderte Fassung trägt den Titel „Preludio“. Die Zweite Etüde, gekennzeichnet als „Molto vivace a Capriccio“, präsentiert eine Technik wiederholter Noten, wobei die erste mit dem Zeigefinger angeschlagen wird und die zweite mit dem Daumen, begleitet von ihrer Oktave mit dem fünften Finger—es ist eine Technik, die nur in wenigen frühen Werken von Liszt angewandt wurde, und die viel besser zu den Klavieren der 1830er Jahre als zu dem modernen Instrument mit seinem undankbar schwerfälligen Wiederholungsmechanismus paßt. Dies muß sogar für die Instrumente und Ausführenden der 1850er Jahre ein Problem gewesen sein, da jede Spur dieser Technik in der endgültigen Fassung fehlt. Als Liszt die Fassung der Dritten Etüde von 1851 Paysage („Landschaft“) betitelte, änderte er ihre Atmosphäre, um sie dieser neuen Idee anzupassen. Es ist interessant, daß der rasante jugendliche Versuch in 4/4 schon in ein Poco adagio in 6/8 umgeändert wurde, im Stück von 1837 der Höhepunkt jedoch ein leidenschaftliches Blatt im Presto agitato assai ergab, das Liszt später für überflüssig hielt. Die Vierte Etüde hatte ihren Ursprung ohne ihre Melodie in der einfachen Handkreuzungs-Übung von 1826 und ist schon auf dem Wege, sich in die vertraute Mazeppa zu verwandeln. (Eine weitere Fassung dieses Stücks, mit dem Titel „Mazeppa“, einer neuen Einleitung, Koda und einer Widmung an Victor Hugo, entstand 1840. Es war geplant, dieses Werk in den vorliegenden Bd. mit aufzunehmen, und das Stück wurde auch aufgezeichnet, die Beschränkung der maximalen Spielzeit einer CD ließ dieses Vorhaben allerdings scheitern, und die „zusätzliche“ Mazeppa wird nun in einem zukünftigen Band erscheinen.) Seltsamerweise beginnt die Fassung des Stücks von 1837 auf eine bedeutend weniger komplizierte Weise als ihr Gegenstück aus dem Jahre 1851, indem sie ohne Umschweife in das Hauptmaterial einsteigt, mit Triolenakkorden als Begleitung. Während in der endgültigen Fassung der Mittelteil das Tempo um einen Bruchteil verlangsamt, schreibt Liszt hier eine leichte Beschleunigung vor, und das gesamte Gefüge ist recht unterschiedlich. Die Koda, die sich noch nicht auf Hugos Gedicht bezieht, ist lebhaft und gedrängt. Wie Liszt sein hübsches kleines Stück aus dem Jahre 1826 in die Fünfte Etüde verwandelte, ist ein kleines Wunder. Die Fassung von 1851, Feux-follets („Irrlichter“), mit ihren komplizierten Doppelnoten bedarf selbstverständlich keiner Einführung mehr. (Dieses Stück wird übrigens oft viel zu schnell gespielt in der Hoffnung, daß der Zuhörer nicht hören wird, daß die Schwierigkeiten durch eine Vereinfachung der Mittelstimme der rechten Hand verwässert worden sind—und dies sogar in einigen der berühmtesten Aufführungen. Liszt kennzeichnete es als „Egualmente“ im Jahre 1837 und als „Allegretto“ im Jahre 1851.) In der Fassung von 1837 ist die Koda geringfügig kürzer, aber im übrigen ist die Struktur des Stückes vertraut. Die Doppelnoten und wiederholten Akkorde sind hier sehr viel schwieriger als in dem Text von 1851. In der Sechsten Etüde hat Liszt wiederum die Idee seines Prototyps von 1826 grundsätzlich verändert durch die Abwandlung des Metrums vom Zweiertakt in einen Tripeitakt. Obwohl er die Idee 1851 wieder fallenließ, schreibt Liszt vor, daß die Themenaufstellung allein von der linken Hand gespielt werden soll. Im übrigen kommt das Stück der späteren Vision recht nahe, abgesehen von einer kurzen Geste in der Reprise in Doppeloktaven und einer gewagten Harmonie in der Koda, bei der selbst Liszt sich gezwungen sah, sie in der späteren Fassung abzuschwächen. Im thematischen Katalog seiner Werke, der noch zu seinen Lebzeiten erschien, versah Liszt all jene Stücke, von denen er verlangte, daß sie nur in ihrer endgültigen Fassung gespielt werden sollten, mit Sternchen. Die Etüden von 1851 sind ein solcher Fall. Wir erlauben uns, in diesem, wie in den meisten anderen Fällen, nicht mit dem Meister übereinzustimmen; das Urteil eines großen Mannes über seine eigenen früheren Werke muß nicht unkritisch respektiert und übernommen werden, und außerdem hatte Liszt, in seiner fast nachlässigen Haltung gegenüber all seinen früheren Produkten, viele Stücke, die nie überarbeitet wurden, einfach verworfen. In der Siebenten Etüde der Reihe von 1837 haben wir ein Stück, das in weiten Kreisen als dem der Revision von 1851 überlegen angesehen wird: Eroica—es ist sicherlich kohärenter, und das Übergangsmaterial von der Einleitung zum Hauptthema (und seine Wiederholung zum Ende hin) ist sehr viel überzeugender als die punktierten Rhythmen, die Liszt 1851 dafür einsetzte. Es gibt hier auch eine letzte Variation des Themas, die später gestrichen wurde, wo Liszt wiederum eine sehr avantgardistische Position in bezug auf die Harmonie einnimmt. Im ersten Takt der Achten Etüde verlangt Liszt das Unmögliche: 42 Noten im Schnellfeuer sind innerhalb eines Pedaltritts zu halten, und trotzdem sollen sechs Melodienoten in jeder Hand akzentuiert werden. Das kann man auf einem Klavier der 1830er Jahre fast noch schaffen, aber in der Fassung von 1851 hat Liszt klugerweise alle Zweiunddreißigstelnoten entfernt. Dennoch ist das schiere Pandämonium hier und anderswo, wo dieses Thema auftritt, unbestreitbar wirkungsvoll. 1851 gab Liszt eine sehr erstaunliche Idee auf: Das dritte Thema, das dem zweiten, daktylischen Jagdmotiv auf dem Fuße folgt, hält das Metrum und den Rhythmus intakt in der linken Hand, während die rechte Hand ein neues Thema herausgreift mit einer Note auf alle vier der Linken, allerdings in einem Metrum, das arithmetisch nicht zur linken Hand paßt—es ist schwindelerregend sowohl beim Spielen wie auch beim Zuhören. (Später änderte Liszt die Melodie dahingehend, daß sie mit der linken Hand übereinstimmte.) Der spätere Titel Wilde Jagd wäre hier noch zutreffender gewesen. Abgesehen von den im Jahre 1851 zu Beginn jeder melodischen Gruppe eingefügten Verschnaufpausen, sind die Neunte Etüde und die spätere Ricordanza sich sehr ähnlich. Hier gibt es zwar um einiges dichtere akkordische Strukturen und ein oder zwei beunruhigende Dissonanzen auf die Koda hin, aber es entsteht unausweichlich die gleiche nostalgische Stimmung. Der aus dem Jahre 1826 stammende Vorläufer dieses Stücks bleibt das erstaunlichste Werk der jugendlichen Etüdenreihe—die Themen und Harmonien wurden im Jahre 1837 fast unverändert übernommen und die Filigranverzierungen heben ihre Schönheit auf die subtilste Weise hervor. Die Zehnte Etüde, die gewöhnlich als die beste der Reihe von 1851 erachtet wird, ist sogar noch beeindruckender in der Fassung von 1837, obwohl Liszts spätere Lösung für die Anlage des Einführungsmaterials eine unruhigere Wirkung hervorruft, indem er die Forderung nach dem Spiel von Melodienoten mit der linken Hand inmitten von Doppelsexten in der rechten wegfallen läßt. Der Text von 1837 weist eine sehr solide Sonatenstruktur auf und unterbricht den Fluß zum Ende der Durchführung hin nicht, fordert aber mitunter sehr schwieriges Spiel über gewaltige Abschnitte. (Man kann mit ziemlicher Sicherheit sagen, daß Liszts Hand sich mit zunehmendem Alter zusammenzog. Amy Fay berichtet aus zuverlässiger Quelle, daß der alte Liszt gerade soeben die Dezimakkorde der schwarzen Tasten am Ende des langsamen Satzes in Beethovens „Hammerklavier“-Sonate bewältigen konnte. In all seinen Überarbeitungen entfernte oder arpeggierte Liszt jedes Intervall, das größer als eine None war, während in den Werken seiner Jahre als öffentlich Vortragender Dezimen und Undezimen im Überfluß vorhanden sind.) Die Fassung von 1837 besitzt eine viel längere Koda, die entsprechend Liszts eigenen Spielanweisungen unvermittelt das Metrum ändert und sehr stürmisch wird. Als Liszt die Zwölfte Etüde in Chasse-neige („Schneepflug'') umwandelte, fügte er einige chromatische Terzen ein, um die Idee der Wirbelwinde zu verstärken, und diese mögen hier zu fehlen scheinen. Zum Ausgleich findet sich jedoch eine sehr schöne Einleitung, die später herausgenommen wurde, und die bei der Reprise wiederkehrt, wo wir später eine ganze Reihe von Läufen vorfinden. Im allgemeinen gibt es recht viel mehr Tremolo in der Fassung von 1837, und dazu ein oder zwei auf typische Art durchdringende harmonische Effekte, die 1851 etwas konventioneller verarbeitet wurden. Die Finalklausel kann hier ebensowenig wie in der späteren Fassung für ein stürmisches Ende benutzt werden, und daher verläßt Liszt uns auf einem Dreiklang zweiter Umkehrung schwebend, als wenn noch etwas nachfolgte. Die einzige noch vorhandene Seite mit Entwürfen für eine Etüde in Fis-Dur, die den zweiten Teil des Unternehmens hätte einleiten sollen, gehört jedoch eindeutig zu einer aufgegebenen Fortsetzung der Serie von 1826. Am Ende kehrt deshalb Liszts großes Kompendium der Virtuosität seinem gepriesenen Gegenstand friedlich den Rücken zu. Als kurze Zugabe und in der vom vorhergehenden Stück am weitesten entfernten Tonalität, e-moll/E-Dur, schließt dieses Programm mit einer Etüde von 1840, die im Jahre 1852 umgearbeitet wurde und den Titel Ab Irato („Im Zorn“) erhielt. Der weniger hochtrabende aber umständliche Titel der vorliegenden Fassung, die zusammen mit Etüden von Bekanntheiten wie Mendelssohn und Chopin für das berühmte Klavier-Handbuch von Moscheies und Fetis komponiert wurde, lautet vollständig: Morceau de salon—Étude de perfectionnement de la Méthode des Méthodes. Dieses athletische kleine Stück hat einen kurzen lyrischen Moment vor der Koda (in der Fassung von 1852 ist das Tempo verlangsamt an dieser Stelle), der nur das rein zufälligste und entfernteste Verhältnis zu einem Thema aus der symphonischen Dichtung Les Préludes hat, und sich in der Tat herleitet aus der Gruppe von drei Noten, die mal steigend, mal fallend das gesamte Werk durchziehen. Es ist bedauernswert, daß einige Kommentatoren versucht haben, hier eine engere Verbindung herzustellen.